Last weekend, it was finally time to relive the best theatrical performance I have ever seen. 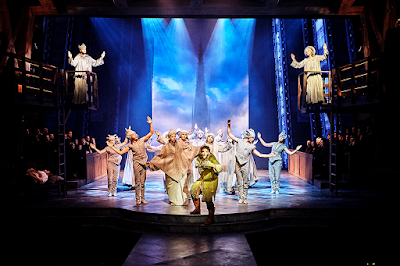 If you haven't read my first review, I recommend you check that out before delving into this – and now, without further ado, let's tackle Fredericia Teater's Danish production of Disney's The Hunchback of Notre Dame. I saw the production twice: on Friday and again on Sunday. I was in Copenhagen for the whole weekend, so in theory, I could have seen the show five times. I however reasoned that if the premiere hit me so hard I could only sleep for about two hours the night after, seeing the show without taking a full day's break in between would probably destroy me. Friday night's performance was like I expected it would be, coming back to the show after the pure magic of the opening night. It's impossible to repeat a once-in-a-lifetime experience, as simple as that. My mood, and the whole audience's mood, felt calmer and quieter than how I remember the October premiere. I didn't want to strangle anyone during the intermission out of sheer excitement (maybe a good thing), but on the other hand, I got to really pay attention to details this time since I didn't feel like foaming at the mouth uncontrollably the whole time. It was good, obviously way better than the vast majority of theatrical performances I've seen. Still, had I only seen the show again this once, I would be feeling way more melancholic and nostalgic for the opening night right now. It didn't feel as incredible as it did the first time, and though I knew to expect that, it was still a slightly melancholy feeling. But then something happened when I came back on Sunday night. The energy and mood in the theatre was different, way more electrifying, though it's impossible to point out why. 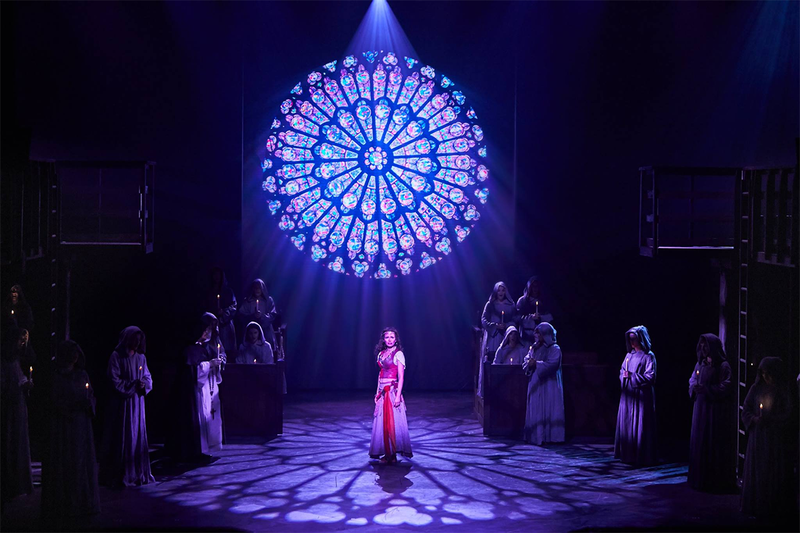 Maybe it felt more exciting to me personally because I sat right next to the catwalk part of the stage, in the middle of all the action (Frollo's cape touched me not once but twice! I feel blessed... by the dark and creepy flames of hellfire, I guess). Or maybe something else was different? I really cannot tell. All I know is that there was magic in the air again. Or maybe it's something to do with one's priorities... 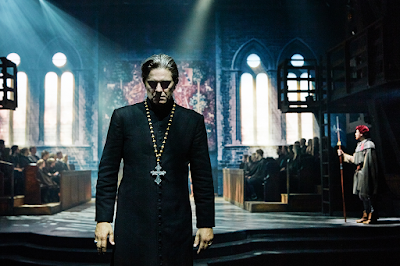 While Friday night was all about watching the show as a whole and analysing everything, I guess I can admit Sunday night was decidedly all about watching Frollo. Every second he's onstage and pretty much without blinking. Archdeacon Claude Frollo, Quasimodo's adoptive father and the antagonist of the story, is one of my biggest favourite characters of all times. He's a scary villain that does many sorts of disturbed things beyond all redemption – and still, still, I cannot help pitying him. All at once, he's far-fetched (he's so distraught about feeling unwanted sexual attraction that he figures he should literally burn the woman in question alive, with all manner of unnecessary dramatics included) and not all that unrealistic at all (an older white man in a position of power with racist and misogynist opinions). He has so many layers, with his relationships to his brother and Quasimodo and obviously Esmeralda, that he's endlessly interesting to think about. Lucky me that Mads M. Nielsen's portrayal has absolutely everything I want to see in the character. There's some good old-fashioned fun villain-ing around with a crazy glint in his eyes, just the right amount of chewing the scenery and even a couple of jokes (his ridiculous cape swish before talking to Esmeralda on the cathedral's roof got me both times). At the same time, he's very terrifying, and when it's needed, also very human. So even when he's at his worst, I cannot help feeling sorry for him – how much better it would be for all of them, Frollo included, if he only was capable of viewing both himself and everybody else in less black-and-white terms. And then there's the voice. And then there's the Hellfire scene. Fredericia Teater's take on Frollo's big solo, Hellfire (during which Frollo comes to the conclusion that Esmeralda must either choose him or die) is quite simply the best thing I've ever seen in theatre. Ever. The music, the choir, the choreography, the digital scenography with the whole cathedral in flames... And, obviously, Nielsen's voice and stage presence. Unreal, I tell you. I could feel this scene (and the second act finale, too) physically, notably raising my heart rate both times. Actually, to be absolutely and completely honest, I spent half of Sunday thinking soon I'll see Hellfire again with and The Hunchback of Notre Dame too as an afterthought. All gushing aside, this is not to say that I don't love the whole cast. Seeing my favourite character played to such perfection was a special treat for me, but I'm quite certain you'd walk out just as ecstatic no matter who your favourite character is. It's an overused word, sure, but I mean exactly what I say when I say the casting of this musical is perfect. I had great difficulty saying anything more than perfect perfect perfect after the opening night, and I'm afraid the problem persists – they're just so good, all of them, it somehow feels quite pointless trying to explain that further. Everything is as it should be. But here are some bullet points. One fascinating thing to watch is the relationship in between Frollo and Lars Mølsted's Quasimodo. In the beginning, there's definitely warmth in between them, moreso than they had in the Berlin production. Makes the ending about six times more powerful. Good heavens. Mølsted won a Singer of the Year award for this role, and hot damn, you don't need to wonder why. 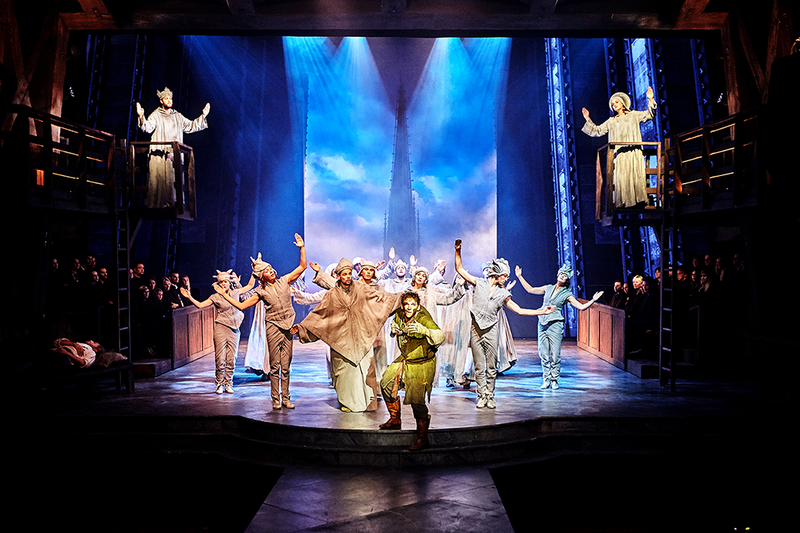 I think my favourite Quasimodo song was the gentle, hopeful Heaven's Light – the dreaminess and sweet optimism creates the perfect contrast for Hellfire that comes right after. 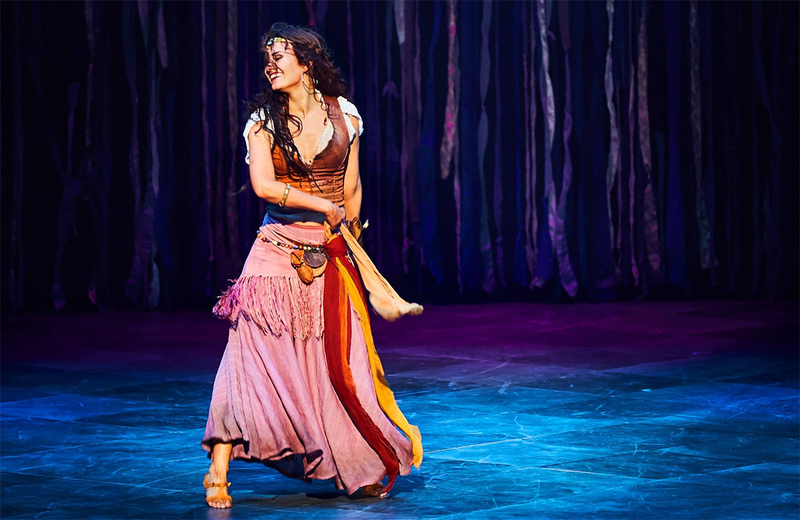 For the summer run, Bjørg Gamst has taken over the role of Esmeralda. She's fantastic. Taking one look at her introductory dance, it's not hard to understand why all the guys are fascinated by her. I had the luck of seeing two charismatic Clopins: principal Diluckshan Jeyaratnam and understudy Mads Æbeløe Nielsen. I mentioned it in my Berlin review already that I'm not really a fan of the musical version of the character, but these two make the most out of the part. Nielsen sported some pretty neat eye makeup in the role. The ensemble! 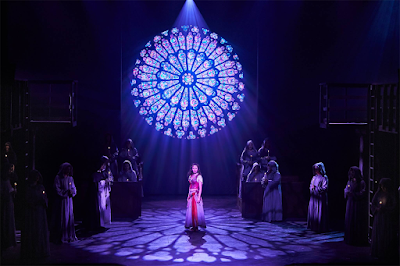 In a show like this, with such a strong focus on choral music and the ensemble playing many different parts from Parisians to the statues of Notre Dame, you cannot overestimate the ensemble's importance – and they're... perfect perfect perfect, really. I am so lucky to have encountered this production in the first place, and to have been able to see it not once but thrice. There certainly are some problems in the musical's script (some things that bother me: the portrayal of the Romani characters is on the stereotypical side, the character of Clopin feels off since the musical takes away his function as the movie's sole narrator but doesn't really give him anything else important to do in exchange, the songs In a Place of Miracles and Someday are basically interchangeable). But when the production's this good... The problems are there, and really, I have a much clearer vision of the musical as a whole now than I did right after the premiere. Yet, at the same time, the good parts are so overwhelming that nothing else matters. All of my three experiences were very different from each other. A part of me wishes I could keep watching the musical again and again until I can remember every single little detail by heart, but that's hardly realistic. So, I'm glad Sunday night's powerful performance will be my last memory of this production. To be completely honest again, right now, I feel like I don't want to see any theatre ever again anymore. Other shows might be good, of course, but they're not this – and at the moment, no other thing feels nearly as interesting or exciting. I know this feeling will fade away the next time I actually see some theatre. At the same time, I know this production will always stay in the back of my mind, as an example of how good theatre can be when it's at its very best. My 11 flames of hellfire out of 10 rating stands. P.S. Three Frollo details I liked the most: 1) how he takes the cross off his neck before visiting Esmeralda in the jail 2) how you can kinda keep track of his mental state by checking out if his hair is neat or all messy 3) him breaking down next to Esmeralda's body. Jeg har for nylig modtaget ekspreslevering af dette ur,replika breitling ure jeg er overrasket over dens udseende! Det har en meget elegant følelse og udskæringen er bedre, end jeg spurgte. Jeg vil have svært ved at holde denne gave hemmelig til min forlovede ... replika breitling colt ure Jeg introducerer denne hjemmeside til mine venner. Venner omkring mig kan prale med, at denne hjemmeside er fantastisk.